I’ve been unable to let go of that entry since reading it, because there’s a part of me that feels like I’ve been too hard on the show in the last few weeks. (A feeling that a lot of you seem to share, based on the last couple weeks’ worth of comments.) 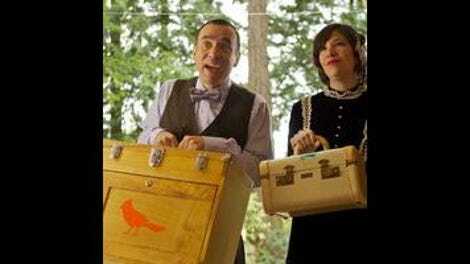 My impression has been that Portlandia has been coasting for the second half of the season, lacking in truly memorable installments and retreading some of the same ground it covered in previous years. I’ve also regularly bemoaned the fact that the show has abandoned the more narrative direction that it took last year, a decision I felt allowed it to transcend its position as a sketch comedy show and set itself up as an innovative hybrid of sketch and sitcom. Looking back on the season as a whole, I’m inclined to be more charitable. Yes, season four of Portlandia may have stepped back from the ambitions of season three, but doing so hasn’t shaken the strong foundation the show was originally built on. It’s even more impressive given that Portlandia has some structural limitations that other sketch comedy shows like Key And Peele and Inside Amy Schumer don’t have, continually mining within the boundaries of a single city for its material. Every week Fred Armisen and Carrie Brownstein keep going to the same well, and somehow they continue to find new takes on the “Portland is weird” mentality and deliver winning installments: the opening ghost sketch with Kirsten Dunst, the Steve Buscemi celery narrative, Spyke’s adventures with cars and weekly newspapers, Jeff Tweedy trying to write a truly authentic song. I still believe the show was better last year when every episode felt like part of a larger whole, but that shouldn’t detract from the fact that when it works, it remains incredibly satisfying. And if cohesion has been one of my main problems this year, the season finale manages to remedy that and allow Portlandia to close on a high note. The last two Portlandia season finales “Brunch Special” and “Blackout” have been tremendously entertaining installments that cash in on the show’s rich universe, taking a few Armisen/Brownstein couples and throwing them into an adventure of surprisingly epic scope. “Getting Away” takes the same approach, and ups the stakes by pushing its chosen couples entirely out of their comfort zone to the unfamiliar universe of New Beavertown—a move made obvious immediately with neatly revised opening credits, theaters and bridges replaced with images of small town attractions and the great outdoors. The episode gets off to a strong start by selecting the right couples for this adventure: ultra-intense Dave and Kath, sweetly distracted Peter and Nance, and militantly feminist Toni and Candace. All three have distinguished themselves on prior finales, and at this point in the show’s run they’re the show’s most fleshed-out pairings. (Fred and Carrie come close, but they’re more fictionalized versions of the creators than they are original creations.) That individuality is further established with the distinctive reasons for why they’re leaving town—a desire to relax, a romantic getaway and a Feminist Moon Weekend, respectively—and the way Jonathan Krisel chooses to shoot and score each of their interactions. A standout scene comes when all three move through the lobby of the New Beavertown hotel, alternating with theatrical efficiency and with noticeable tonal shifts as the actors switch out characters. That lobby ushers all three couples to new adventures, thanks to a well-placed kiosk of brochures. Dave and Kath’s quest for peace and quiet is derailed when Kath sees a brochure for an outlet mall, sending them into a near-rabid hunger for discounts. Portlandia had a great sketch earlier this season with Malcolm and Kris’ accidental sweatshop, and this flips circumstances terrifically as Dave and Kath excitedly peruse clothes that even a Portland vintage shop would think twice about carrying. (Kath: “Is that a cigarette burn or a bullet hole?” Dave: “It’s like a beauty mark!”) Their continual obliviousness leads them to buy three-piece fleece and camp out in the car for the earliest deals, a desire for which reveals Kath as the pair’s most intense member. Compared to those—and indeed compared to most people in general—Peter and Nance enjoy a quieter experience, locking into a walking tour of New Beavertown. Yet their experience becomes as complicated as their time in brunch jail or their Birdman-motivated walkabouts, as Peter reads the cartoon map so literally that he’s unable to find his way back to the hotel. (“Now if I go this way, the giant beaver in the construction hat…”) Peter’s stammer has a one-note quality, but Fred Armisen somehow manages to make him endearing every time he fumbles through situations he makes worse, and Nance’s eternal patience with him extends so far that she’s prepared to be homeless for a night. Toni and Candace have the most active reaction to the kiosk, and that reaction is to take it with them as they enter the woods, payment for an imagined slight by the concierge. That reaction is driven by redirected passive-aggression, as the two are furious that their all-women weekend has been “penetrated” by a male bus driver, Kimtopher (Kim for short). Played by Armisen’s former Saturday Night Live co-star Jason Sudeikis (his first appearance since playing a cult leader in the pilot episode), Kim is exactly the sort of person it’s funniest for the bookstore owners to hate—someone who doesn’t deserve a bit of it because he dares to be affable and tolerant. His friendship with the women of the group—including one played by country singer k.d. lang—stands in stark contrast to Toni and Candace, reduced to lurking just off-screen and hissing with disapproval. All of these adventures would be enough for an episode, but Portlandia finales have a taste for pushing their adventures to the extreme, and ironically it’s Peter who accelerates things too far. After miraculously seeing the giant beaver that was on the map he carves his and Nance’s initials on it, and the action is seen as an act of war on the part of the exiled beavers of Grimwood. Here’s where things take on the expected scope, as a simultaneously adorable and frightening CGI beaver gnaws through a dam and submerges the entire town. Portlandia’s always been good at creating a high-stakes feeling, and “Getting Away” effectively portrays a flooded city through stock footage and location shoots. While coping with this disaster can make for a good source of comedy, Portlandia has always been equally invested in strengthening its characters, and all the couples find a satisfying resolution. Dave and Kath manage to patch their raft up using their new fleece stockpile, and realize that in this chaos they’ve never felt more alive—a surprising amount of self-awareness given how typically dense they are. Peter and Nance having a moment on top of a bench is less surprising as they’ve now come out of three catastrophes stronger than ever, but Armisen and Brownstein have such easy chemistry as these two especially that it can’t help be sweet. The most miraculous part of the finale though comes when the resolution turns out to from the last source you’d expect. It’s easy to treat Toni and Candace as a pair of uptight and out-of-touch small-business owners, whose commitment to their beliefs doesn’t mesh with any form of reality. This season has gradually chiseled away at that perception, with the duo successfully spearheading a car wash and guiding the Trail Blazers to a dunk-centric winning streak. (The team could use some of that energy right now in the playoffs, especially after last night.) They lock arms with their retreat comrades—all clad in terrifically unflattering underwear—and beseech Mother Moon to turn back the tide in between arguing about the proper use of “mist” and “midst,” the episode’s best running gag. Wonder of wonders, it works, and the river subsides enough to let them walk back to camp in a newfound sense of unity. This allows the finale to end in a wonderfully positive way, as when the bus has washed away the group decides to walk home. Under the clearing clouds, accompanied by k.d. lang strumming a gorgeous version of “Down In The River To Pray,” they head down the bridges and back to their beloved city. “Getting Away” is a terrific close to the season, one that allows Portlandia to both go big and go home within the same half-hour. This Week In Portland: Nothing, given the episode doesn’t even take place in city limits. But for anyone looking for some real getting away, I recommend a day trip to hike either the falls on Historic Columbia River Highway or Beacon Rock on the Washington side. If you have more time, either Astoria or Newport make for a great weekend trip to the coast. You might have missed the best joke of the night if you weren’t paying attention and don’t watch Grimm, but the hiker who warns Toni and Candace they’re heading into beaver territory is played by Danny Bruno, better known as easily flustered Eisbeiber (beaver Wesen) Bud. I hoped for more Grimm cameos after Silas Weir Mitchell appeared in “Celery,” and it’s good to see the synergy continues. A bit disappointing not to see Kyle MacLachlan one last time, especially because this is the first season finale he’s missed. Then again, I suppose after the last finale Mr. Mayor has a crippling fear of getting outside of city limits. One final complaint: after how effectively the show paired up Spyke and Lance, I badly want to see Armisen and Brownstein try mixing up their pairings more in season five. There’s a lot of comedic potential there that’s barely been tapped. Great sight gag in the outlet mall: There’s a rack of fleece that simply says “Green,” and there doesn’t appear to be a single green garment there. And the flood waters recede, taking this season and these reviews with them. Thanks for reading, everyone! Hope to see you next year for season five.